George Fox Steedman (pronounced Sted'-man) was far from the simple "blacksmith" he modestly incorporated into the estate name. He was, in fact, a true Renaissance man, equally talented in business and the arts. Creative and inventive, he combined an engineer's common sense with an artist's sensibility. Based in St. Louis, George's father - a doctor who liked to dabble in business investments - bought controlling interest in a machine shop, and young George found himself operating the firm with his two brothers. Known as the Curtis Company, it was a foundry and manufacturing firm specializing in saws, air compressors and pneumatic equipment. George Steedman immersed himself in the world of machines, studying every aspect of their design, production and interaction. Married in 1903 to Carrie Robb Howard and soon father of two girls, Katherine and Medora, George was a devoted family man. At the same time, he was guiding the Curtis Company to increasing success - mainly through his own inventions and the machine and munitions contracts he secured for the firm during the first World War, which ended in 1918. After experiencing the stress of wartime, along with the discovery a few years later of an unsuspected heart abnormality, George Steedman decided to simplify his life, change his priorities and turn from industry to the arts. The study of architecture had fascinated him as a student at Harvard, so he set out, with typical enthusiasm, to create a new home in a very different environment: Montecito, California. Many Spanish treasures found in this upstairs bedroom remain intact from a 1923 buying trip to Spain by George Steedman and friends. No architect could have better matched Steedman's creative imagination than G.W. Smith, who encouraged owner participation in the planning process. Over the next three years the men's joint efforts produced a splendid example of a Spanish Colonial Revival residence, surrounded by carefully planned grounds and gardens. The estate, when finished, was exactly what George Steedman had in mind when he began the project with this direction to Smith: "I don't want anything showy, but I want it good." 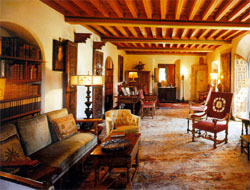 The house and garden were begun in 1922, both planned to be authentically Spanish in every detail. Local landscape artist Ralph Stevens and horticulturist Peter Reidel worked with the architect to create plantings that would complement the residence, consulting frequently with the famed landscape architect Lockwood de Forest. In 1923, George Steedman went to Spain with friends from St. Louis who were experts on Spanish antiques. They purchased tiles, carved wooden doors, iron grilles, leaded windows, a Gothic ceiling, garden pots and wrought iron gates, among other treasures. Every "find" was destined for its special place in the house or garden, so carefully had Steedman studied the plans before embarking on his search. Back in Montecito Steedman continued his collaboration with G.W. Smith, helping to develop over 200 drawings of Spanish details that reveal his design talent, particularly in the studies leading to the unusual curved stairway off the dining room. Both perfectionists, Steedman and Smith were unrelenting in their attention to detail, having completed as many as forty revised versions before settling on the final plan of the house. Completed for occupancy by June 1925, Casa del Herrero (House of the Blacksmith) was named by George Steedman, reflecting his successful career in the metal business and his hobby of metal crafting. On the morning of June 29, when Steedman was in Santa Barbara preparing to move in and ready the home for his wife's arrival, Santa Barbara's great earthquake struck at 6:45 a.m., destroying some of the city's finest structures. Rushing out to Montecito, Steedman was much relieved to find his new home - built of steel-reinforced masonry - completely intact and without a crack. 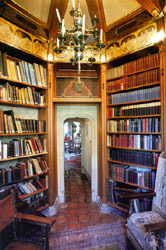 Steedman's passion for Gothic design is evident in the octagonal library room, designed by Lutah Marie Riggs and based on a French medieval chateau tower. Like many local estate owners in those days, the Steedmans spent only part of each year in Montecito, usually summers. In 1930, however, after five years of seasonal visits, they moved here permanently, settling in to enjoy their home and its wonderful gardens year round. At the west side of the main house, George Steedman designed and had built a large workshop, complete with a casting furnace, forge, tools (many self-crafted) and space for tons of raw materials that he used for silver, bronze and aluminum casting as well as wrought iron work. In that workshop "the blacksmith" was in his element, happily producing everything from switch-plates, vases and urns to a massive set of garden furniture cast in aluminum to replicate old Spanish tables and chairs made of wood and quilted leather. In addition to his life as a craftsman, Steedman pursued other interests with equal energy. When his wife began winning awards for her camellias, he used his silversmithing talents to create vases in which to display them. He then photographed the vases of flowers and developed the photos in his darkroom beneath the workshop - where he might also have enjoyed a glass of his own wine, expertly made and stored in the private lower level winery! A few minor buildings were added in the early 1930s - a lath house and potting shed, a garage, and a guest cottage built for daughter Medora and her son George to use during a 1932 visit. Then all work on the estate was completed and it looked much as we see it today. Inside and out, Casa del Herrero is Andalusian in spirit. Like the architecture and gardens of southern Spain, it retains a sense of mystery, with a surprise around each corner as the house reveals itself one room at a time, disclosing along with its Spanish elements hints of the Mediterranean and Moroccan. This theme is continued on the grounds in a series of small Moorish gardens, designed as outdoor "rooms." Each one is enclosed by hedges, trees and unusual plantings, and centered with tiled Moorish fountains and water channels. On the south side of the house, the view from the main terrace follows a long "garden axis" with five fountains flowing from one to the other by means of gravity. George Steedman not only planned the engineering concept of the water course, but he designed the decorative fountain tiles himself and had them crafted in Tunisia. Spanish and Moorish tiles may, in fact, be the most indelible memory a visitor carries away from Casa del Herrero. They are everywhere: covering every inch of a bathroom's surface in exotic patterns, bordering another room with charmingly primitive animals, brightening the walls around doorways and windows, or, to the east of the house, forming an exciting multicolored facade on the beautiful exedra (garden wall with attached benches and fountain patio). Decorative tile even appears on the pump house, which was designed in 1928 by Plunkett & Edwards, then one of Santa Barbara's foremost architectural teams. Covering the deep artesian ell that provided water for the Steedman estate, the pump house - situated north of the property on Picacho Lane - was built in Spanish Revival style with an impressively tiled facade. George Steedman died in 1940 and his wife continued to live at the estate for the next 23 years until her death in 1963. Their daughter Medora Steedman Bass lived at Casa del Herrero and devoted the rest of her life to keeping the estate essentially as it was when her parents were alive. After her death in 1987, the property was placed in trust, with her son George S. Bass as sole trustee, or the eventual donation to a charity or non-profit organization. Toward this goal, George Bass has enlisted the aid of several interested local people to form the Casa del Herrero Foundation, which will own and operate the estate for the benefit of the community. 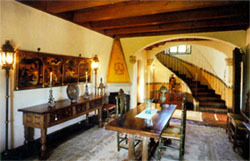 The Foundation plans to preserve Casa del Herrero as a living museum to be enjoyed by those interested in its history and unique beauty. Members of the Foundation hope to protect Casa del Herrero as a treasured community resource.